Someone recently brought to my attention a blog post by historian Martin van Creveld arguing that the present state of international relations is comparable to that of the early 17th century, and that we may be at the beginning of another Thirty Years’ War. This puts me once again in the unfortunate position of arguing that the period of history with which I am most familiar bears a lot less similarity to our present situation than some people would like to claim. I thought it would be helpful on the reasons that I disagree with the historical comparison. It is true that we share some similarities with the situation at the start of the Thirty Years’ War: a multipolar international system, religious division and associated violence, and a rebellion (Bohemia in 1618, Syria in the present day). But the differences go much deeper than the similarities. The religious conflict in our day is quite different from the Protestant-Catholic division in early modern Europe. The Reformation had split a single religion with 1500 years of common history; radical Islam proposes to export its vision of society to places that have never been Islamic. In fact, there is hardly an opposing religion at all in Europe, where secularism is widespread. If there is a religious war, it is all on one side. Then, too, Islam is at war with itself. The Islamic religious division goes back nearly as long as the religion itself and continues to divide Muslims from each other, often with violent consequences. Even this, however, is not the only or even the decisive division within Islam; rather, it is the vision of fundamentalist Muslims who want to shape society in a narrowly religious fashion against moderate Muslims who have largely accepted the modern framework of individual rights. This is a curious form of religious war in which one religion wages war on all other religions and simultaneously on different forms of itself. It could hardly be more different than the Lutheran, Calvinist, and Catholic conflict in early modern Europe, in which different denominations of the same religion sought above all a safe space for themselves, and, secondarily, the conversion of other Christians to their way of thinking. The rebellion in Syria also bears little relation to the Bohemian revolt against the Habsburgs. Unlike the political context of the Bohemian revolt, which took place in the Holy Roman Empire, Syria lacks a common history and shared set of political institutions going back 500 years (a point I made in response to another suggestion relating the Peace of Westphalia to Syria). There may be some common feeling among Syria’s diverse population, but it is also likely that Syrian Shi’ites feel more of a bond with Shi’ites in Iraq than with Sunnis in their own country, and that Sunnis also have strong international loyalties. It is true that some German Protestants looked to England or the Netherlands or Sweden for support against the Catholic threat, but only a few of the most radical had any desire to break up the Empire fundamentally. Germans of all denominations were firmly attached to the idea of a German nation with a shared heritage, a fact that consistently frustrated foreign rules who expected greater rewards for their support of co-religionists. At the same time that this common German bond was a crucial factor in the war, so was the Empire’s uniquely decentralized structure. Its subordinate units — duchies, counties, bishoprics, cities, and other political entities — were functionally independent for many purposes, and carried on relations with foreign powers with virtual impunity. It was no stretch for France or Sweden to sign a treaty with Bavaria or Brandenburg and use it as an excuse to intervene militarily in the war, because it was clear what Bavaria and Brandenburg were; indeed, they maintained their own military force independent of the rest of the Empire, as did many other large estates. There are no such subordinate political entities in Syria, and America’s experience with trying to fund rebels has shown that it is not at all clear which rebels it is supplying with arms and whether a successful overthrow would be beneficial to American foreign policy — or whether it would be a tragic defeat. This doesn’t prevent foreign intervention in Syria, of course, but it makes it a drastically different matter than what happened in the Thirty Years’ War. Van Creveld compares Iran to France under Richelieu, watching other states fight and covertly supporting whatever parties it chooses. This is true as far as it goes, but that is not very far when one considers that Richelieu is correctly perceived as having sought to isolate religion from politics as much as possible, whereas Iran puts religious goals above politics and “reason of state.” Richelieu was put in his position because he was allied with Protestants of various stripes and needed their support to be successful; Iran would apparently rather lose decisively than sacrifice its religious principles for political gain. Van Creveld notes that civilian populations bore a heavy cost in both the Thirty Years’ War and in the modern Middle East. That is certainly true, but it is important to distinguish the effect on civilians in areas affected by the fighting from the effect on civilians affected only by terrorist attacks. Tiny numbers of people are killed by terrorism at present. An army in a territory dominates it and is capable of extracting resources and killing virtually at will. Terrorism is committed precisely by groups that don’t control territory and are too small and insignificant to hope to do so. They do not extract resources but rather create fear and uncertainty as a matter of policy. Terrorism, had it been possible in the 17th century, would not have had nearly the same effect because random death (mostly due to natural causes) was so much more common that terrorism would not have brought the shock that it does today. In the Thirty Years’ War, all participants were directly affected by the conflict; in the present war, it is chiefly the states in the Middle East that bear this burden, while those supplying arms and money are affected in much more limited ways. This brings us to a point of particular importance to me: how would this new “Thirty Years’ War” be resolved? In the 1640’s, the war was ended by a meeting of the major powers at conflict in the Empire: Spain, France, the Netherlands, Sweden, and, of course, Austria. The Empire’s other constituent units had a role because they possessed enough political power to make life difficult for the outside powers, but their participation was largely restricted to internal matters such as religion. There is no conceivable conference of powers that could resolve to end the Middle Eastern conflict. Perhaps they could temporarily end the fighting in Syria, but none of them, even all of them together, has the power to end terrorism and sectarian Islamic fighting at the stroke of a pen. The Empire attracted so much foreign intervention because it was literally at the center of Europe and so much power stood in the balance if one side gained a preponderance of force there. Syria is of minimal strategic importance to the West. If it should happen to be pacified, there are a dozen other countries where Islamic radicals could and would wage war, and even more possibilities for terrorists to train and plan for their next attack. The people with the leading interest in Syria are Syrians and their neighbours, but the fighting in Syria is inchoate and the loci of political authority difficult to identify apart from the Assad regime. 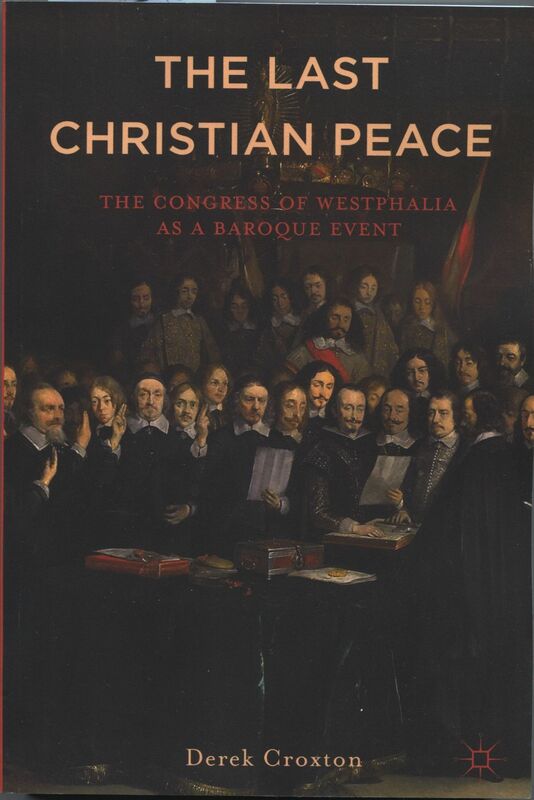 Although I have argued that Westphalia was not the origin of state sovereignty in a practical or a theoretical sense, it seems a model of sovereignty compared to the problems facing the Middle East right now. The Thirty Years’ War was chiefly about the arrangement of political authority in the Holy Roman Empire, and it was able to be solved chiefly by allowing power to rest with local units so that no one side could become a danger to the other, or to any neighbouring powers. The war in Syria is about political authority in Syria and in the rest of the Middle East; no purely Syrian solution is going to solve the underlying conflict of goals because there are parties that have no intention to restrict themselves to national boundaries. In that sense, the war in Syria is both less serious in its international repercussions that the war in the Empire, and also much, much harder to resolve. The Thirty Years’ War was the last war in Europe fought primarily for religious reasons. Does anyone think that the Syrian civil war will be the last Middle Eastern war fought for religious reasons? I was happy finally to receive my copies of the paperback edition of “Last Christian Peace” last week. Even though I had to settle for the same cover art (for lack of money to pay royalties on the painting I wanted), I am much happier with this version than the last one. The title on the hardcover (besides being different) was far too vertical and difficult to read. I thought the same thing of the text. The paperback is much easier to read and creates a pleasing effect. I am also excited that the local Barnes and Noble agreed to carry a few copies of my book. (I intend to ask New Dominion Books as well, but haven’t made it there.) Even if no one buys it, it has long been a fantasy of mine to see my own book in a bookstore. The store’s general manager was so nice and kept asking, “I wonder what will happen?” as though it might become a big seller. It almost certainly won’t, but it makes me happy to have the opportunity. I’m pleased to say that the paperback version of my book is now available online. You will probably notice that the subtitle has become the title, and there is a new and more descriptive subtitle. The book, however, is the same, except for two or three almost trivial changes. I have never heard of a paperback having a different title than the hardcover, but I like this title better, so I am not complaining. I also really, really like the cover design better than the hardback, which I found far too vertical and hard to read. I had the same problem with the text, so I hope the paperback will be different in that regard as well. I don’t know yet, because I haven’t received my copies, so I’ll just have to wait and see. Available for $35 (list) down to about $26 if you get it from Wal-Mart. I also found another review that has been published, this one by Claire Gantet in the Revue d’histoire moderne et contemporaine. It is in French so perhaps out of reach of much of my audience. It is a nice review, rather brief but fair. My favourite part was her description of my “faultless erudition.” The biggest criticism was the absence of a list of primary sources, and the use of “The Three Musketeers” as a source. Well, it’s not so much a source as a means of helping people understand the time period, but I admit it is an odd thing to find in a footnote. I have now learned that the AHR review was written by Peter Wilson, one of the foremost scholars on the period. I have also been able to read the rest of the review, and I can say that Professor Wilson understands my arguments and summarizes them admirably. It is a very good review (in the sense of conveying what the book is about). 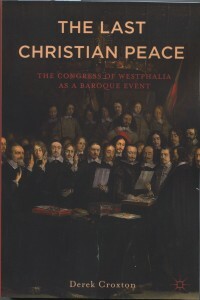 It took nearly two years, but a review of my book “Westphalia: The Last Christian Peace” has finally appeared in a scholarly journal. The link will only take you to the first page of the review unless you are subscribed to the American Historical Review, which I am not. However, since it says the book fills a gap “admirably” and describes it as “important,” I’m happy. I wonder if the other dozen journals that received review copies will start coming out with reviews now? Perhaps two years is about the time it takes a scholarly journal to publish a review. The recent letter that 47 Republican Senators sent to Iran concerning President Obama’s authority to negotiate has a distant echo in events leading up to the Congress of Westphalia. At the Diet of Regensburg in 1641-42, Imperial estates were disappointed with Emperor Ferdinand III’s unwillingness to accept negotiations with France and Sweden to end the war. While they pressured him to accept the Treaty of Hamburg (1641), which established the framework for a peace conference, they also took direct action by writing to the governments of France and Sweden. Their purpose was to encourage the foreign powers to make peace, at least in part by signalling the willingness of Imperial estates to negotiate, regardless of whether the Emperor seemed to be equally well disposed. The two events, historical and contemporary, both have their roots in a government where power is shared among different branches. The Emperor had long claimed exclusive authority to conduct foreign policy, but the estates also insisted that they had an advisory role, much as the United States’ Senate must give its advice and consent before a foreign treaty can become law. While no one disputes that the Senate has this role in the United States, it is uncertain whether the letter crosses into the president’s domain of conducting negotiations. The letter also addresses the distinction between an executive agreement, which can be made without the Senate’s consent but which lacks the force of law, and a duly ratified treaty. One distinction between the events of 1642 and 2015 is that the Imperial Diet wrote in its official capacity as a body representing the Empire. The Republicans’ letter was sent by individual members of the Senate and not in the form of an official act. After a year and a half, I finally read a short excerpt from my book “The Last Christian Peace,” added some images, and put the resulting video on YouTube. It took a lot longer than I had expected, and it isn’t perfect by any means, but I think it is an improvement over my last attempt at a video. Let me know what you think. 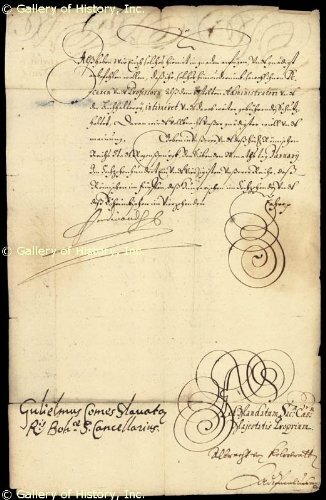 I just noticed that you can buy the letter signed by Emperor Ferdinand III (shown left) at Amazon.com. My first thought was, who would want a letter signed by Ferdinand III? Charles I, maybe, or Louis XIV, or Richelieu, but Ferdinand III? He is not exactly a monarch whose name is known to a lot of people outside of period specialists. Today I came up with a logo, left, and am beginning to incorporate it into the site. 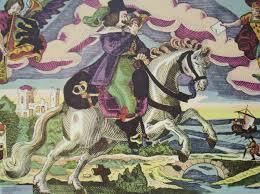 The letters are “epw” and stand for “Everything Peace of Westphalia.” The post horn that makes up part of the letter “p” is for the “peace rider” (Friedensreiter) motif, a postillion riding into towns to bring news of the peace. This was commonly used after the war as a symbol of peace (see image, below).